Not to be confused with Muscle. Mussel (/ˈmʌsəl/) is the common name used for members of several families of bivalve molluscs, from saltwater and freshwater habitats. These groups have in common a shell whose outline is elongated and asymmetrical compared with other edible clams, which are often more or less rounded or oval. 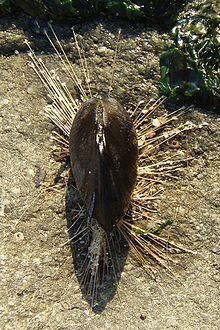 The word "mussel" is frequently used to mean the bivalves of the marine family Mytilidae, most of which live on exposed shores in the intertidal zone, attached by means of their strong byssal threads ("beard") to a firm substrate. A few species (in the genus Bathymodiolus) have colonised hydrothermal vents associated with deep ocean ridges. The common name "mussel" is also used for many freshwater bivalves, including the freshwater pearl mussels. Freshwater mussel species inhabit lakes, ponds, rivers, creeks, canals, and they are classified in a different subclass of bivalves, despite some very superficial similarities in appearance. Marine blue mussel, Mytilus edulis, showing some of the inner anatomy. The white posterior adductor muscle is visible in the upper image, and has been cut in the lower image to allow the valves to open fully. 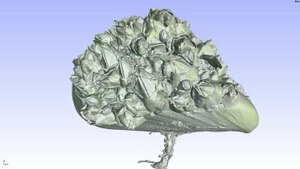 Flight around a 3D-Rendering of a µCT-Scan of a young Mytilus that is almost completely covered with Balanidae (barnacles). Resolution of the scan is 29µm/Voxel. The mussel's external shell is composed of two hinged halves or "valves". The valves are joined together on the outside by a ligament, and are closed when necessary by strong internal muscles (anterior and posterior adductor muscles). Mussel shells carry out a variety of functions, including support for soft tissues, protection from predators and protection against desiccation. The shell has three layers. In the pearly mussels there is an inner iridescent layer of nacre (mother-of-pearl) composed of calcium carbonate, which is continuously secreted by the mantle; the prismatic layer, a middle layer of chalky white crystals of calcium carbonate in a protein matrix; and the periostracum, an outer pigmented layer resembling a skin. The periostracum is composed of a protein called conchin, and its function is to protect the prismatic layer from abrasion and dissolution by acids (especially important in freshwater forms where the decay of leaf materials produces acids). Like most bivalves, mussels have a large organ called a foot. In freshwater mussels, the foot is large, muscular, and generally hatchet-shaped. It is used to pull the animal through the substrate (typically sand, gravel, or silt) in which it lies partially buried. It does this by repeatedly advancing the foot through the substrate, expanding the end so it serves as an anchor, and then pulling the rest of the animal with its shell forward. It also serves as a fleshy anchor when the animal is stationary. In marine mussels, the foot is smaller, tongue-like in shape, with a groove on the ventral surface which is continuous with the byssus pit. In this pit, a viscous secretion is exuded, entering the groove and hardening gradually upon contact with sea water. This forms extremely tough, strong, elastic, byssal threads that secure the mussel to its substrate allowing it to remain sessile in areas of high flow. The byssal thread is also sometimes used by mussels as a defensive measure, to tether predatory molluscs, such as dog whelks, that invade mussel beds, immobilising them and thus starving them to death. In cooking, the byssus of the mussel is known as the "beard" and is removed before the mussels are prepared. Both marine and freshwater mussels are filter feeders; they feed on plankton and other microscopic sea creatures which are free-floating in seawater. A mussel draws water in through its incurrent siphon. The water is then brought into the branchial chamber by the actions of the cilia located on the gills for ciliary-mucus feeding. The wastewater exits through the excurrent siphon. The labial palps finally funnel the food into the mouth, where digestion begins. Marine mussels are usually found clumping together on wave-washed rocks, each attached to the rock by its byssus. The clumping habit helps hold the mussels firm against the force of the waves. At low tide mussels in the middle of a clump will undergo less water loss because of water capture by the other mussels. Both marine and freshwater mussels are gonochoristic, with separate male and female individuals. In marine mussels, fertilization occurs outside the body, with a larval stage that drifts for three weeks to six months, before settling on a hard surface as a young mussel. There, it is capable of moving slowly by means of attaching and detaching byssal threads to attain a better life position. Freshwater mussels reproduce sexually. Sperm is released by the male directly into the water and enters the female via the incurrent siphon. After fertilization, the eggs develop into a larval stage called a glochidium (plural glochidia), which temporarily parasitizes fish, attaching themselves to the fish's fins or gills. Prior to their release, the glochidia grow in the gills of the female mussel where they are constantly flushed with oxygen-rich water. In some species, release occurs when a fish attempts to attack the mussel's minnow or other mantle flaps shaped like prey; an example of aggressive mimicry. Glochidia are generally species-specific, and will only live if they find the correct fish host. Once the larval mussels attach to the fish, the fish body reacts to cover them with cells forming a cyst, where the glochidia remain for two to five weeks (depending on temperature). They grow, break free from the host, and drop to the bottom of the water to begin an independent life. 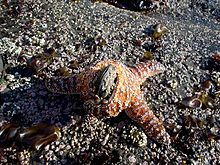 Marine mussels are eaten by humans, starfish, seabirds, and by numerous species of predatory marine gastropods in the family Muricidae, such as the dog whelk, Nucella lapillus. Freshwater mussels are eaten by otters, raccoons, ducks, baboons, humans, and geese. Certain species of marine mussels prefer salt marshes or quiet bays, while others thrive in pounding surf, completely covering wave-washed rocks. Some species have colonized abyssal depths near hydrothermal vents. The South African white mussel exceptionally does not bind itself to rocks but burrows into sandy beaches extending two tubes above the sand surface for ingestion of food and water and exhausting wastes. Bouchots are marine pilings for growing mussels, here shown at an agricultural fair. Bamboo is used for mussel breeding and propagation (Abucay, Bataan, Philippines). In 2005, China accounted for 40% of the global mussel catch according to a FAO study. Within Europe, where mussels have been cultivated for centuries, Spain remained the industry leader. Aquaculture of mussels in North America began in the 1970s. In the US, the northeast and northwest have significant mussel aquaculture operations, where Mytilus edulis (blue mussel) is most commonly grown. While the mussel industry in the US has increased, in North America, 80% of cultured mussels are produced in Prince Edward Island in Canada. In Washington State, an estimated 2.9M pounds of mussels were harvested in 2010, valued at roughly $4.3M. 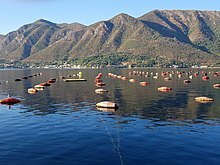 Longline culture (rope culture) mussel farm in Bay of Kotor, (Montenegro). Freshwater mussels are used as host animals for the cultivation of freshwater pearls. Some species of marine mussel, including the Blue mussel (Mytilus edulis) and the New Zealand green-lipped mussel (Perna canaliculus), are also cultivated as a source of food. In some areas of the world, mussel farmers collect naturally occurring marine mussel seed for transfer to more appropriate growing areas, however, most North American mussel farmers rely on hatchery-produced seed. Growers typically purchase seed after it has set (about 1mm in size) or after it has been nursed in upwellers for 3-6 additional weeks and is 2-3mm. The seed is then typically reared in a nursery environment, where it is transferred to a material with a suitable surface for later relocation to the growing area. After about three months in the nursery, mussel seed is "socked" (placed in a tube-like mesh material) and hung on longlines or rafts for grow-out. Within a few days, the mussels migrate to the outside of the sock for better access food sources in the water column. Mussels grow quickly and are usually ready for harvest in less than two years. Unlike other cultured bivalves, mussels use byssus threads (beard) to attach themselves to any firm substrate, which makes them suitable for a number of culture methods. On-bottom culture: On-bottom culture is based on the principle of transferring mussel seed (spat) from areas where they have settled naturally to areas where they can be placed in lower densities to increase growth rates, facilitate harvest, and control predation (Mussel farmers must remove predators and macroalgae during the growth cycle). Raft culture: Raft culture is a commonly used method throughout the world. Lines of rope mesh socks are seeded with young mussels and suspended vertically from a raft. The specific length of the socks depends on depth and food availability. 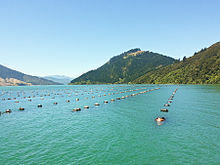 Longline culture (rope culture): Mussels are cultivated extensively in New Zealand, where the most common method is to attach mussels to ropes which are hung from a rope back-bone supported by large plastic floats. 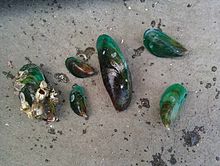 The most common species cultivated in New Zealand is the New Zealand green-lipped mussel. Longline culture is the most recent development for mussel culture and are often used as an alternative to raft culture in areas that are more exposed to high wave energy. A long-line is suspended by a series of small anchored floats and ropes or socks of mussels are then suspended vertically from the line. In roughly 12–15 months, mussels reach marketable size (40mm) and are ready for harvest. Harvesting methods depend on the grow-out area and the rearing method being used. Dredges are currently used for on-bottom culture. Mussels grown on wooden poles can be harvested by hand or with a hydraulic powered system. For raft and longline culture, a platform is typically lowered under the mussel lines, which are then cut from the system and brought to the surface and dumped into containers on a nearby vessel. After harvest, mussels are typically placed in seawater tanks to rid them of impurities before marketing. Cleaning mussels in a mussel farm (Bay of Kotor, Montenegro). Byssal threads, used to anchor mussels to substrates, are now recognized as superior bonding agents. A number of studies have investigated mussel "glues" for industrial and surgical applications. Additionally byssal threads have provided insight into the construction of artificial tendons. Mussels are widely used as bio-indicators to monitor the health of aquatic environments in both fresh water and the marine environments. They are particularly useful since they are distributed worldwide and they are sessile. These characteristics ensure that they are representative of the environment where they are sampled or placed. Their population status or structure, physiology, behaviour or the level of contamination with elements or compounds can indicate the status of the ecosystem. Marine nutrient bioextraction is the practice of farming and harvesting marine organisms such as shellfish and seaweed for the purpose of reducing nutrient pollution. Mussels and other bivalve shellfish consume phytoplankton containing nutrients such as nitrogen (N) and phosphorus (P). On average, one live mussel is 1.0% N and 0.1% P. When the mussels are harvested and removed, these nutrients are also removed from the system and recycled in the form of seafood or mussel biomass, which can be used as an organic fertilizer or animal feed-additive. These ecosystem services provided by mussels are of particular interest to those hoping to mitigate excess anthropogenic marine nutrients, particularly in eutrophic marine systems. While mussel aquaculture is actually promoted in some countries such as Sweden as a water management strategy to address coastal eutrophication, mussel farming as a nutrient mitigation tool is still in its infancy in most parts of the world. Ongoing efforts in the Baltic Sea (Denmark, Sweden, Germany, Poland) and Long Island Sound and Puget Sound in the U.S. are currently examining nutrient uptake, cost-effectiveness, and potential environmental impacts of mussel farming as a means to mitigate excess nutrients and complement traditional wastewater treatment programs. In the United States and Canada, areas home to the most diverse freshwater mussel fauna in the world, there are 297 known freshwater mussel taxa. Of the 297 known species, 213 (71.7%) taxa are listed as endangered, threatened, of special concern. The main factors contributing to the decline of freshwater mussels include destruction from dams, increased siltation, channel modification, and the introduction of invasive species like the Zebra mussel. Humans have used mussels as food for thousands of years. About 17 species are edible, of which the most commonly eaten are Mytilus edulis, M. galloprovincialis, M. trossellus and Perna canaliculus. Nowadays, freshwater mussels are generally considered to be unpalatable and are almost entirely not consumed, although the native peoples of North America ate them extensively and still do today. In the USA during the Second World War, mussels were commonly served in diners and eateries across the country. This was due to the lack of access to red meat (such as beef and pork) for the general public, in relation to the aspect of the American wartime rationing policy concerning food, with much of the meat available being sent to aid the US military's war efforts abroad. Instead, mussels became a popular substitute for most meats (with the exception of chicken). In Belgium, the Netherlands, and France, mussels are consumed with French fries ("mosselen met friet" or "moules-frites") or bread. In Belgium, mussels are sometimes served with fresh herbs and flavorful vegetables in a stock of butter and white wine. Fries and Belgian beer sometimes are accompaniments. 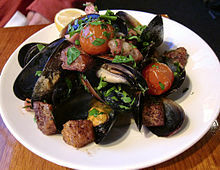 In the Netherlands, mussels are sometimes served fried in batter or breadcrumbs, particularly at take-out food outlets or informal settings. In France, the Éclade des Moules, or, locally, Terré de Moules, is a mussel bake that can be found along the beaches of the Bay of Biscay. In Italy, mussels are mixed with other sea food, they are consumed often steam cooked (most popular), sometimes with white wine, herbs, and served with the remaining water and some lemon. In Spain, they are consumed mostly steam cooked, sometimes boiling white wine, onion and herbs, and served with the remaining water and some lemon. They can also be eaten as "tigres", a sort of croquette using the mussel meat, shrimps and other pieces of fish in a thick bechamel then breaded and fried in the clean mussel shell. They are used in other sort of dishes such as rices or soups or commonly eaten canned in a pickling brine made of oil, vinegar, peppercorns, bay leaves and paprika. In Turkey, mussels are either covered with flour and fried on shishs ('midye tava'), or filled with rice and served cold ('midye dolma') and are usually consumed after alcohol (mostly raki or beer). They are used in Ireland boiled and seasoned with vinegar, with the "bray" or boiling water as a supplementary hot drink. In Cantonese cuisine, mussels are cooked in a broth of garlic and fermented black bean. In New Zealand, they are served in a chili or garlic-based vinaigrette, processed into fritters and fried, or used as the base for a chowder. In India, mussels are popular in Kerala, Maharashtra, Karnataka-Bhatkal, and Goa. They are either prepared with drumsticks, breadfruit or other vegetables, or filled with rice and coconut paste with spices and served hot. Fried mussels ('Kadukka' കടുക്ക in Malayalam) of north Kerala especially in Thalassery are a spicy, favored delicacy. In coastal Karnataka Beary's prepare special rice ball stuffed with spicy fried mussels and steamed locally known as "pachilede pindi". Simple mussels roasting in a mussel farm (Bay of Kotor, Montenegro. Mussels can be smoked, boiled, steamed, roasted, barbecued or fried in butter or vegetable oil. As with all shellfish, except shrimp, mussels should be checked to ensure they are still alive just before they are cooked; enzymes quickly break down the meat and make them unpalatable or poisonous after dying or uncooked. Some mussels might contain toxins. A simple criterion is that live mussels, when in the air, will shut tightly when disturbed. Open, unresponsive mussels are dead, and must be discarded. Unusually heavy, wild-caught, closed mussels may be discarded as they may contain only mud or sand. (They can be tested by slightly opening the shell halves.) A thorough rinse in water and removal of "the beard" is suggested. Mussel shells usually open when cooked, revealing the cooked soft parts. Historically, it has been believed that after cooking all the mussels should have opened and those that have not are not safe to eat and should be discarded. However, according to marine biologist Nick Ruello, this advice may have arisen from an old, poorly researched cookbook's advice, which has now become an assumed truism for all shellfish. Ruello found 11.5% of all mussels failed to open during cooking, but when forced open, 100% were "both adequately cooked and safe to eat." Although mussels are valued as food, mussel poisoning due to toxic planktonic organisms can be a danger along some coastlines. For instance, mussels should be avoided along the west coast of the United States during the warmer months. This poisoning is usually due to a bloom of dinoflagellates (red tides), which contain toxins. The dinoflagellates and their toxin are harmless to mussels, even when concentrated by the mussel's filter feeding, but if the mussels are consumed by humans, the concentrated toxins cause serious illness, such as paralytic shellfish poisoning. A person affected in this way after eating mussels is said to be musselled. Foods that are an "excellent source" of a particular nutrient provide 20% or more of the recommended daily value. Foods that are a "good source" of a particular nutrient provide between 10 and 20% of the recommended daily value. ^ a b The Editors of Encyclopædia Britannica (22 May 2009). "Mussel". Encyclopædia Britannica. ^ Vaccaro, Eleonora; Waite, J. Herbert (2001-09-01). "Yield and Post-Yield Behavior of Mussel Byssal Thread: A Self-Healing Biomolecular Material". Biomacromolecules. 2 (3): 906–911. doi:10.1021/bm0100514. ISSN 1525-7797. ^ a b c "Mussel Culture in British Columbia". BC Shellfish Growers Association. ^ Calta, Marialisa (August 28, 2005). "Mussels on Prince Edward Island". The New York Times. Retrieved April 26, 2009. ^ Northern Economics, Inc. "The Economic Impact of Shellfish Aquaculture in Washington, Oregon and California" (PDF). Prepared for Pacific Shellfish Institute. Retrieved November 30, 2018. ^ a b "Cultured Aquatic Species Information Programme, Mytilus edulis". FAO. ^ Bilic, Grozdana; Brubaker, Carrie; Messersmith, Phillip B.; Mallik, Ajit S.; Quinn, Thomas M.; Haller, Claudia; Done, Elisa; Gucciardo, Leonardo; Zeisberger, Steffen M.; Zimmermann, Roland; Deprest, Jan; Zisch, Andreas H. (2010). "Injectable candidate sealants for fetal membrane repair: bonding and toxicity in vitro". American Journal of Obstetrics and Gynecology. 202 (1): 85.e1–9. doi:10.1016/j.ajog.2009.07.051. PMC 2837921. PMID 20096254. Lay summary – Science Daily (January 23, 2010). ^ Qin, Zhao; Buehler, Markus J. (2013). "Impact tolerance in mussel thread networks by heterogeneous material distribution". Nature Communications. 4: 2187. doi:10.1038/ncomms3187. PMID 23880603. Lay summary – redOrbit (July 24, 2013). ^ "Ribbed Mussel Pilot Study in the Bronx River, New York City". Long Island Sound Study. ^ "Nutrient Mitigation". Puget Sound Restoration Fund. ^ a b Haag, Wendell (2012). North American Freshwater Mussels: Natural History, Ecology, and Conservation. Cambridge University Press. ISBN 9780521199384. ^ Williams, James D.; Jr, Melvin L. Warren; Cummings, Kevin S.; Harris, John L.; Neves, Richard J. (1993-09-01). "Conservation Status of Freshwater Mussels of the United States and Canada". Fisheries. 18 (9): 6–22. doi:10.1577/1548-8446(1993)018<0006:CSOFMO>2.0.CO;2. ^ Zeldes, Leah A. (2010-10-13). "Eat this! Mussels, mighty fine mollusks". Dining Chicago. Chicago's Restaurant & Entertainment Guide, Inc. Retrieved 2010-11-17. ^ "Mussel myth an open and shut case". ABC Science. 2008-10-29. Retrieved 2015-08-04. ^ Oxford English Dictionary: mussel (verb). ^ "Calories in Mussel, raw | Nutrition, Carbohydrate and Calorie Counter". Calorieking.com. Retrieved 2012-08-27. ^ "Full Nutrition Info and calories in Raw Blue Mussels". Wikimedia Commons has media related to Mussel. Look up mussel in Wiktionary, the free dictionary.